According to medieval legend Elynas, the King of Albany, while out hunting in the forest came across a beautiful lady. This woman was Pressyne the Fairy Queen. Being quite smitten with her King Elynas asked for her hand in marriage. She agreed but only on the condition that he not invade her privacy when she gave birth or when she bathed their children. She gave the King triplets. Three girls named Melusine, Melior, and Palatyne. Inevitably the day came when King Elynas violated this taboo whereupon Pressyne packed up and left the poor King of Albany taking their daughters with her to the lost isle of Avalon. Later when Melusine learned of her fathers indiscretion she imprisoned him in a mountain with all his treasure as punishment. This displeased Pressyne who cursed her daughter condemning her to take the form of a serpent (or of a fish) from the waist down every Saturday. "From the Devil they came", growled St Bernard, "and to the Devil they will return." There were many who agreed with him. Popular gossip told of their descent from a devilish ancestress- it was a convenient explanation of their demonic energy, their ferocious ruthlessness. In the days of long ago, when all fairy stories are credible, a count of Anjou, men said, returned from a distant journey with a strange woman whom he married. She was evidently a lady and very beautiful, but there was much that was odd about her: she had no relatives or friends, she seldom went to church, and when she did always made some excuse to leave before the Consecration. In time her husband became so puzzled by this behaviour that he instructed four of his knights to stay close by her when next she entered the church, and prevent her slipping out. Just as the Consecration was beginning she made as if to leave, but the knights trod on the hem of her robe to detain her. As the priest raised the Host above his head she uttered a scream, wrenched apart the fastening of her cloak to escape from it, and still shrieking flew out of the window. She was Melusine, daughter of Satan, and no evil spirit, as is well known, can look upon the Body of Christ. In her flight she dragged two of her children with her; but two remained and from them were descended the Angevin kings of England. Henry II's sons, with characteristically profane humour, were prone to joke about the story, and to people who protested against their fighting among themselves they replied: "Do not deprive us of our heritage; we cannot help acting like devils." Winged succubus, Fairy Princess, or mermaid. So goes the legend. But what are the historical facts behind these legends if any? The House of Luxembourg, The Counts of Anjou, the Lusignan Counts of Poitou, The Kings of England and Scotland, and the Weir (or Vere) family, all claim descent from The Fairy Queen Melusine. But who was she? The Dragon Court's theory suggests that she was the Pictish Dragon Princess Maelasanu who was a descendant of the royal house of the Tuatha de Danaan as well as being a descendant of the Davidic House of Judah and Egyptian Dynasty of Sobek. According to Magnus Magnusson in his book "Scotland: The Story of a Nation", Kenneth mac Alpin, who is credited with uniting the royal lines of the Picts and the Scots Dalriada, claimed descent from a princess named Scota who was a daughter of the Pharaoh Ramses II. She left egypt shortly after the Israelites crossed the Red Sea. She wondered for 1200 years in the eastern Mediterranean deserts before making her way to Scotland. She brought with her the Stone of Scone or Stone of Destiny which the Kings of Scotland have always been crowned upon. This stone is said to be the same as the one that Jacob used as a pillow when he had his dream about a ladder to heaven. Her husband is said to have been Gaedel Glas, a prince of Scythia. Or so the legend goes. This interpretation lends support to the Dragon Courts claim that Melusine was descended from an Egyptian Dynasty. 1. Geoffrey Plantagenet was born 1113, and died 1151. He married Matilda of England, daughter of King Henry and of Matilda. She was born Abt. 1104, and died September 10, 1167. GEOFFREY, surnamed PLANTAGENET, COUNT d’ANJOU, born 1113, died 1151. King Henry I, of England, in despair over loss of his son, William, Duke of Normandy, who was drowned in the sinking of a ship off the coast of France, sought the aid of GEOFFREY PLANTAGENET, one of the most powerful princes of France, a noble person, with “elegant and courtly manners and a reputation for gallantry in the field.” Approving the marriage of his daughter MATILDA with GEOFFREY, King Henry personally invested him with Knighthood, and expressed the hope that all Englishmen would give them full allegiance. The Barons took the oath to uphold the succession of Matilda and Geoffrey and their children after them. Thus Geoffrey heads the line of English kings which bear his Plantagenet name. The friends of Geoffrey were unaware that their playful nickname for him of Plantagenet would live through the years. Geoffrey was descended from the Elven Princess Plantina, sister of the Fairy Princess Melusine I. Thus he derived his popular title. As eldest son of FULK V, KING OF JERUSALEM, and his wife, Princess Melusine III, Geoffrey was of the House of Angevin Kings, which had been prominent for three centuries. Geoffrey’s descent from the House of Angevin Kings follows: From Princess Plantina, sister of the Fairy Princess Melusine – TORQUAT C760. TORTULF C780. THERTULLUS C.800 (Tortulf the Woodman of Nide de Merle), wife PETRONELLA, daughter of Conrad, Count of Paris; (2) INGELERUS I, married Adeline of Challon; (3) FULK, “the red,” born 888, died 938, wife Roscilla of Blois; (4) FULK II, The Good, Count of Anjou, died 958, married Gerberga of Catinais; (5) GEOFFREY I, Count of Anjou, died 21 July 987, married Adelaide de Vermandois, also known as Adelaide de Chalons, born 950, died 975-78; (6) FULK III, “the Black” Count of Anjou, born 970, died 21 June 1040, married, second, after 1000, Hildegarde, who died 1 April 1109, married, fifth, Bertrade de Montfort; (9) FULK V, “The Young,” Count of Anjou, King of Jerusalem, born 1092; died 10 Nov. 1143, who, as above stated, was the father of GEOFFREY V “PLANTAGENET,” Count of Anjou, Duke of Normandy, who, on 3 April 1127, married MATILDA of ENGLAND, daughter of HENRY I, of England. NOTE: Also being given below, is the descent of Geoffrey V of Anjou, (called “Plantagenet”) husband of Matilda (Maud), of England, from KING EDWARD THE GREAT. GENEALOGY OF GEOFFREY PLANTAGENET (born 1113, died 7 Sept. 1151, from Aedd Mawr) (KING EDWARD THE GREAT), who appears to have lived about 1300 B.C. (the line of BOAZ and RUTH) to WILLIAM THE CONQUEROR, whose Genealogy back to ROLLO the DANE, is given: (1) KING EDWARD the GREAT, his son; (2) BRYDAIN, who settled in the island at an early date, and, according to tradition, gave his name to the entire island, which has since been corrupted into “Britain.” His son; (3) ANNYN TRO, his son; (4) SELYS HEN, his son; (5) BRWT, his son; (6) CYMRYW, his son; (7) ITHON, his son; (8) GWEYRYDD, his son; (9) PEREDUR, his son; (10) LLYFEINYDD, his son; (11) TEUGED, his son; (12) LLARIAN, in whose day London was a considerable town, having been founded B.C. 1020, or earlier, as some hold, at least 270 years before the founding of Rome; his son; (13) ITHEL, his son; (14) ENIR FARDD, his son; (15) CALCHWYDD, his son; (16) LLYWARCH, his son; (17) IDWAL, his son; (18) RHUN, his son; (19) BLEDDYN, his son; (20) MORGAN, his son; (21) BERWYN, his son; (22) CERAINT FEDWW, an irreclaimable drunkard, deposed by his subjects for setting fire, just before harvest, to the cornfields of Siluris, now Monmouthshire, his son; (23) BRYWLAIS; his son; (24) ALAFON, his son; (25) ANYN, his son; (26) DINGAD, his son; (27) GREIDIOL, his son; (28) CERAINT, his son; (29) MEIRION, his son; (30) ARCH, his son; (31) CAID, his son; (32) CERI, his son; (33) BARAN, his son; (34) LLYR, (KING LEAR). He was educated in Rome by Augustus Caesar, his son; (35) BRAN, KING of SILURIA. In the year AD 36, he resigned the crown to his son Caradoc, and became Arch-Druid Bran the Blessed of the college of Siluria. Bran married Anna, granddaughter of St. James (Joseph of Aramathea); the neice of Jesus Christ. Jesus and his brother St. James’ lineage conjoin with The Uther Pendragon: Aedan Mac Gabran King of Scots, who married Ygraine of Avallon (see Avallon descent). During his seven years in Rome, Bran (St. Brandon) became the first royal convert to Christianity and was baptized by the Apostle Paul, as was his son, Cardoc, and the latter’s two sons, Cyllinus and Cynon (he introduced the use of vellum into England). his son; (36) CARADOC (CARACTACUS), was King of Siluria, (Monmouthshire, etc. ), his son; (37) ST. CYLLIN, King of Siluria. He, first of the Cymry (Cimmerians of Scythia), gave infants names, for before, names were not given except to adults. His brother, Linus the Martyr; his sister Claudia and her husband Rufus Pudens, aided the apostle Paul in the Christian Church in Rome. As recorded in II Timothy 4:21 and Romans 16:13, Rufus Pudens and St. Paul are shown to be half-brothers, children of the same mother, they had different fathers; Paul, by a Hebrew husband and Rufus, by a second marriage with a Roman Christian. His son; (38) PRINCE COEL, son of Cyllin was living AD 120; his son; (39) KING LLEUVER MAWR, (Lucius the Great), the second Blessed Sovereign, married Gladys, whose ancestry for eight immediate past generations is as follows; (a) CAPOIR, whose son was; (b) BELI (HELI) THE GREAT, died B.C. 72, whose son; (c) LUD, died B.C. 62, his son; (d) TENUANTIUS, his son; (e) CYNVELINE (Cymbeline), King of Britain. He was educated in Rome by Augustus Caesar, and later, forestalled the invasion of the island. His eleventh son; (f) AVIRAGUN, King of Britain, lived in Avalon (The Isle of Arran), the renowned enemy of Rome; married VENISSA JULIA, daughter of TIBERIUS CLAUDIUS CAESAR, EMPEROR OF ROME, who was the grandson of MARK ANTONY. The son of Aviragus and Venissa Julia was; (g) MERIC, (Marius,), King of Britain, married the daughter of the GODDESS-QUEEN BOADICEA (VICTORIA.). They had a daughter; (h) EURGEN, and later a son Coel, who became King of Britain in 125. OLD KING COLE, educated in Rome, built Colchester (Coel-Castra), and died AD 170. (h) EURGEN, (see above), the said daughter of Meric, (Marius) and his wife, the daughter of Boadicea, had, as above stated, Gladys, who became the wife of No. 39 (see above), Lleuver Mawr (Lucius the Great) who is said to have changed the established religion of Britain from DRUIDISM to CHRISTIANITY though this must be patently untrue. The daughter of Lucius the Great and his wife, Gladys, was; (40) GLADYS, who became the wife of Cadvan, of Cambria, Prince of Wales. Their daughter; (41) STRADA, the FAIR, married Coel, a later King of Colchester, living AD 232. Their daughter; (42) HELEN of the CROSS (The Arms of Colchester were a “cross with three crowns”), Helen was born 248, died 328 and became the wife of CONSTANTIUS I, afterward Emperor of Rome, and, in right of his wife, King of Britain. He was born 242, died 306. Their son; (43) CONSTANTINE THE GREAT, born 265, died 336. British birth, he is known as the first CHRISTIAN EMPEROR. The greatest of all Roman Emperors, he annexed Britain to the Roman Empire, his son; (44) CONSTANTIUS II, died in 360, his son; (45) CONSTANTIUS III, married Placida, died in 421, his son; (46) VALENTINIAN III, died in 455. His daughter; (47) EUDOXIA, married Hunneric, who died in 480. her son; (48) HILDERIC, King of the Vandals in 525, his daughter; (49) HILDA, married Frode VII, who died 548; her son; (50) HALFDAN, KING OF DENMARK, his son; (51) IVAR VIDFADMA, KING of DENMARK and SWEDEN in 660 his son: (52) RORIC SLINGEBAND, KING of DENMARK and SWEDEN in 700, his son; (53) HARALD HILDETAND, KING of DENMARK and SWEDEN in 725, his son; (54) SIGURD RING, living in 750, his son; (55) RAYNER LODBROCK, KING of DENMARK and SWEDEN, died in 794, married Aslanga. Aslanga was granddaughter of the one-eyed, hooded God-King ODIN, Father of Sigfreid and Brunhilde: the Swan Princess and Valkyrie. LORD OF THE AESIR, Odin was the inspiration for both Tolkien’s Gandalf – Grey Elf – and the one-eyed Sauron Lord of the Rings, from Saur, a Dragon. Odin was the ancestor of Robert de Vere, the historical Robin Hood or Hoden. RAYNER LODBROCK’S son; (56) SIGURD SNODOYE, KING of DENMARK and SWEDEN, died 830, his son; (57) HORDA KNUT, KING of DENMARK, died in 850, his son; (58) FROTHA, KING of DENMARK, died 875, his son; (59) GORM ENSKE, married Sida and died in 890, his son; (60) HAROLD PARCUS, KING of DENMARK, whose wife was Elgiva, daughter of ETHELRED I, King of England, (a brother of King Alfred The Great), his son; (61) GORM del CAMMEL, KING of DENMARK, died in 931. His wife was Thyra, his son; (62) HAROLD BLAATAND, KING of DENMARK, died in 981, his daughter; (63) LADY GUNNORA, wife of Richard I, third Duke of Normandy, born 933, died 996. They had (beside their son Richard II ((see later)), a son; (64) ROBERT d’EVEREUX, the Archbishop, who died in 1087, his son; (65) RICHARD, Count d’Evereux, died in 1067, his daughter, (66) AGNES EVEREUX, who became the wife of Simon l de Montfort, her daughter; (67) BERTRADE MONTFORT, became the wife of FULK IV, Count d’Anjou, born 1043, died 1109. It was she who led him to embrace Christianity, and mythically three thousand of his followers were baptized in a single day. When Clovis first listened to the story of Christ’s Crucifixion, he was so moved that he cried, “If I had been there with my valiant Franks, I would have avenged Him.” Ausbert and Blithildes were the parents of (19) ARNOUL, Bishop of Metz, died 601, married Oda de Savoy and had (20) ST. ARNOLPH, Bishop of Metz, died 641, married Lady Dodo and had, (21) ACHISEA, married Begga of Brabant, who died 698, their son; (22) PEPIN d’HERISTAL, Mayor of the Palace, died 714, who married Alpais. PEPIN of HERISTAL made himself conspicuous. His home was near Spa in the woodland country around Liege. He made the office hereditary in his family. His heroic son, (23) CHARLES MARTEL, the Hammer, Mayor of the Palace, King of France, was still more famous, because, in the decisive Battle of Tours in 732, he utterly routed the Arabs, who had conquered Spain and the south of France. Charles Martel Married Rotrude and died in 741. His son, (24) PEPIN THE SHORT (or PEPIN le BREF), King of France, died in 768, leaving by his wife Bertha, of Laon, a son; (25) CHARLEMAGNE, Charles the Great, born 2 April 742, probably at Aix-La-Chapelle, the greatest figure of the Middle Ages, King of the Franks. 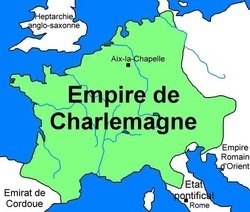 Charlemagne and his younger brother, Carloman, succeeded to equal portions to one of the most powerful of European kingdoms, bounded by the Pyrenees, the Alps, the Mediterranean and the Ocean. Carloman, the younger brother, died soon after the death of their father, Pepin The Short, and with the consent of the great nobles, Charlemagne became King. Desiderius, the King of Lombardy, had made large encroachments upon the states of the Roman Pontiff, whose cause was taken up by Charlemagne. This led to feuds, which Bertha, his mother, endeavored to appease by arranging a marriage between her son and the daughter of the Lombard. But the King Lord Charlemagne soon took a disgust to the wife thus imposed upon him, and repudiated her, that he might marry Hildegarde, born 757, died 30 April 782, the daughter of a noble family in Suabia. By his wife, Hildegarde, he had a son: (26) LOUIS I, the DEBONAIRE, who by his second wife, Judith, was the father of Gisela, ancestress of Hugh Capet, King of France and of JAMICIA, wife of RICHARD de CLARE, MAGNA CHARTA SURETY. Louis I, by his first wife Ermengarde, who died 818, daughter of Ingram, Count of Basbania, was father of (27) LOTHAIRE, Earl of Germany, who married Ermengarde of Alsace, and had (28) ERMENGARDE, who was the wife of Giselbert. Their son; (29) REGUIER I, Count of Hainault, died 916, who married Albreda, their son; (30) CISELBERT, Duke of Lorraine, married Gerlerga and died 930, their daughter; (31) ALBREDA of LORRAINE, wife of Renaud, Count de Roucy, who died 973, their daughter; (32) ERWENTRUDE ROUCY, married Alberic II, Count de Macon, who died 975, their daughter; (33) BEATRICE MACON, married Geoffrey I de Castenais, their son; (34) GEOFFREY II de CASTINAIS, married Ermengarde de Anjou, their son; (35) FULK IV, Count of Anjou, born 1043, died 1109, married Bertrade de Montfort (no. 67 above), their son (36) FULK V, Count d’Anjou, who, as elsewhere stated (above) was the father of GEOFFREY PLANTAGENET, who married MATILDA of ENGLAND, a great-great-great-grand daughter of RICHARD I, Duke of Normandy and his wife, Lady Cunnora. Matilda’s descent from Richard I, Duke of Normandy is as follows: (1) RICHARD I, Duke of Normandy, his son; (2) RICHARD II, Duke of Normandy, died 1026, married Judith de Bretagne, their son; (3) ROBERT the MAGNIFICENT, also known as Robert the Devil, who, by Herleve Falaise, had WILLIAM THE CONQUEROR, father of King Henry I of England, who had Matilda, Wife of Geoffrey Plantagenet. NOTE: WURTS’ MAGNA CHARTA, pp. 158-168 inclusive, gives sixty nine Generations of lineal descent from No. 1, Edward the Great, (Aedd Mawr) to No. 69, Geoffrey Plantagenet. This also shows Geoffrey’s descent from the FRANKISH KINGS, Nos. 1, to and including 35; also his descent from No. (6) (HELI) Beli the Great through LUD, through TUANTIUS, through CYNVELIN (CYMBELINE), through AVIRAGUS, through MERIC (MARIUS), through EURGEN, through GLADYS, wife of No. 39, (LLEUVER MAWR) LUCIUS THE GREAT. And page 168 of Wurt’s Magna Charta shows that both Geoffrey Plantagenet and his wife, Matilda, or Maud, of England, were descendants of WILLIAM THE CONQUEROR, who, as above stated, was descended from CHARLEMAGNE. Descent from CHARLEMAGNE to MATILDA, or Maud, of England, wife of GEOFFREY PLANTAGENET; (1) CHARLEMAGNE and wife, Hildegarde had a son; (2) PEPIN, born 776, died 8 July 810, before his father. He was crowned by the Pope in 781, King of Lombardy and Italy, married Bertha, daughter of William, Count of Toulouse, his son; (3) BERNHARD, King of Lombardy, succeeded his father about the year 812, he was deposed by his Uncle Louis, blinded and put to death. By his wife Cunegonde, he had a son; (4) PEPIN, who was deprived of the throne by his Uncle Louis, Emperor, called the Debonair, and received a part of Vermandois and the Seigneuries of St. Quentin and Peronne. His son; (5) PEPIN, Pepin de Senlis de Valois, Count Berengarius, of Bretagne, who was living in 893, the father of (6) LADY POPPA, (puppet or doll), who became the first wife of ROLLO the DANE, first Duke of Normandy. Their son; (7) WILLIAM LONGSWORD, was father of (8) RICHARD the FEARLESS, father of; (9) RICHARD II, “the Good,” whose son; (10) ROBERT “THE DEVIL,” sixth Duke of Normandy, who, by Herleve de Falaise, daughter of the Tanner, Fulbert de Falaise, had a son; (11) WILLIAM THE CONQUEROR, born at Falaise in 1027, father of HENRY I, KING of ENGLAND, WHO WAS THE LAST OF THE NORMAN KINGS. (Magna Charta 178, 182, 183). She was designated Henry’s heir, and on his death (1135), Stephen seized the throne and Matilda invaded England (1139) inuagurating a period of inconclusive civil war. She and her second husband (Geoffrey) captured Normandy and in 1152 the Treaty of Wallingford recognised Henry as Stephen’s heir. Burke says she was betrothed in her eighth year (1119) to Henry. July 06, 1189 in Chinon Castle, Anjou. King Henry II Plantagenet. He married (1) Eleanor of Aquitaine May 18, 1152 in Bordeaux, France. She died June 26, 1202. He met (2) Rosamond De Clifford 1160. He met (3) Ida Abt. 1172. KING HENRY II of ENGLAND, son of Matilda, or Maud, of England and her husband, Geoffrey Plantagenet, was born at Le Mans, 25 March 1133 and died at Chinon, 6 July 1189. In 1152 he married Eleanor of Aquitaine, former wife of Louis VII, of France, and daughter of William, Duke of Aquitaine. She survived King Henry nearly three years, dying 26 June 1202. Both were buried at Fontrevaud in Anjou. Their daughter Eleanor married Alphonse IX, King of Castile; their eldest son William, died at the age of four years, their second son, Henry, born 28 Feb. 1155, who on 15 July 1170, by command of his father, was crowned King of England, but died before his father, 11 July 1183, their third son, Richard the Lion Hearted, reigned as King of England from 1189 to 1199. He was the most prominent leader on the Third Crusade to regain Jerusalem for the Christians from the Mohammedans. He had greater military genius, but less statesmanship than his father. Henry II (1154-1189) Born: 5th March 1133 at Le Mans, Maine. Died: 6th July 1189 at Chinon Castle, Anjou. Buried: Fontevrault Abbey, Anjou. Parents: Geoffrey, Count of Anjou and the Empress Matilda. Siblings: Geoffrey, Count of Nantes & William, Count of Poitou. Crowned: 19th December 1154 at Westminster Abbey, Middlesex. Married: 18th May 1152 at Bordeaux Cathedral, Gascony. Spouse: Eleanor, daughter of William X, Duke of Aquitane & divorcee of Louis VII, King of France. Offspring: William, Henry, Matilda, Richard, Geoffrey, Eleanor, Joan & John. Contemporaries: Louis VII (King of France, 1137-1180), Thomas Beckett (Archbishop of Canterbury), Pope Adrian IV, Frederick I (Frederick Barbarossa, Holy Roman Emperor, 1152-1190). Henry II, first of the Angevin kings, was one of the most effective of all England’s monarchs. He came to the throne amid the anarchy of Stephen’s reign and promptly collared his errant barons. He refined Norman government and created a capable, self-standing bureaucracy. His energy was equalled only by his ambition and intelligence. Henry survived wars, rebellion, and controversy to successfully rule one of the Middle Ages’ most powerful kingdoms. Henry was raised in the French province of Anjou and first visited England in 1142 to defend his mother’s claim to the disputed throne of Stephen. His continental possessions were already vast before his coronation: He acquired Normandy and Anjou upon the death of his father in September 1151, and his French holdings more than doubled with his marriage to Eleanor of Aquitane (ex-wife of King Louis VII of France). In accordance with the Treaty of Wallingford, a succession agreement signed by Stephen and Matilda in 1153, Henry was crowned in October 1154. The continental empire ruled by Henry and his sons included the French counties of Brittany, Maine, Poitou, Touraine, Gascony, Anjou, Aquitaine and Normandy. Henry was technically a feudal vassal of the king of France but, in reality, owned more territory and was more powerful than his French lord. Although King John (Henry’s son) lost most of the English holdings in France, English kings laid claim to the French throne until the fifteenth century. Henry also extended his territory in the British Isles in two significant ways. First, he retrieved Cumbria and Northumbria from Malcom IV of Scotland and settled the Anglo-Scottish border in the North. Secondly, although his success with Welsh campaigns was limited, Henry invaded Ireland and secured an English presence on the island. English and Norman barons in Stephen’s reign manipulated feudal law to undermine royal authority; Henry instituted many reforms to weaken traditional feudal ties and strengthen his position. Unauthorized castles built during the previous reign were razed. Monetary payments replaced military service as the primary duty of vassals. The Exchequer was revitalized to enforce accurate record keeping and tax collection. Incompetent sheriffs were replaced and the authority of royal courts was expanded. Henry empowered a new social class of government clerks that stabilized procedure – the government could operate effectively in the king’s absence and would subsequently prove sufficiently tenacious to survive the reign of incompetent kings. Henry’s reforms allowed the emergence of a body of common law to replace the disparate customs of feudal and county courts. Jury trials were initiated to end the old Germanic trials by ordeal or battle. Henry’s systematic approach to law provided a common basis for development of royal institutions throughout the entire realm. The process of strengthening the royal courts, however, yielded an unexpected controversy. The church courts instituted by William the Conqueror became a safe haven for criminals of varying degree and ability, for one in fifty of the English population qualified as clerics. Henry wished to transfer sentencing in such cases to the royal courts, as church courts merely demoted clerics to laymen. Thomas Beckett, Henry’s close friend and chancellor since 1155, was named Archbishop of Canterbury in June 1162 but distanced himself from Henry and vehemently opposed the weakening of church courts. Beckett fled England in 1164, but through the intervention of Pope Adrian IV (the lone English pope), returned in 1170. He greatly angered Henry by opposing the coronation of Prince Henry. Exasperated, Henry hastily and publicly conveyed his desire to be rid of the contentious Archbishop – four ambitious knights took the king at his word and murdered Beckett in his own cathedral on December 29, 1170. Henry endured a rather limited storm of protest over the incident and the controversy passed. Henry’s plans of dividing his myriad lands and titles evoked treachery from his sons. At the encouragement – and sometimes because of the treatment – of their mother, they rebelled against their father several times, often with Louis VII of France as their accomplice. The deaths of Henry the Young King in 1183 and Geoffrey in 1186 gave no respite from his children’s rebellious nature; Richard, with the assistance of Philip II Augustus of France, attacked and defeated Henry on July 4, 1189 and forced him to accept a humiliating peace. Henry II died two days later, on July 6, 1189. A few quotes from historic manuscripts shed a unique light on Henry, Eleanor. Concerning endowments of mind, he was of a spirit in the highest degree generous . . . His custom was to be always in action; for which cause, if he had no real wars, he would have feigned . . . To his children he was both indulgent and hard; for out of indulgence he caused his son Henry to be crowned King in his own time; and out of hardness he caused his younger sons to rebel against him . . . He married Eleanor, daughter of William Duke of Guienne, late wife of Lewis the Seventh of France. Some say King Lewis carried her into the Holy Land, where she carried herself not very holily, but led a licentious life; and, which is the worst kind of licentiousness, in carnal familiarity with a Turk. “King Henry II Plantagenet, had many illegitimate children, one of which was William de Longespee. 3 i. Eleanor7. She married Alphonse IX. 4 ii. William, born Abt. 1153; died Abt. 1157. 5 iii. Henry, born February 28, 1154/55; died July 11, 1183. 6 iv. Richard, born Abt. 1157. He married Perengaria May 12, 1191. Reigned as King of England from 1189 to 1199. He was the most prominent leader on the Third Crusade to regain Jerusalem for the Christians from the Mohammedans. He had greater military genius, but less statesmanship than his father. His great power was in his physical and mental capacity as a soldier, and in his strenuous and irrepressible courage. Richard was proud, cruel and treacherous. He left the government of England in the hands of his Justiciars, and was in his English Kingdom but twice in his reign of ten years; four months at the time of his coronation, and two months, five years later. The Third Crusade was a failure. Richard fell out with the French King, and refused to marry his sister Alice, to whom he had been betrothed since early childhood, but on 12 May 1191, he married Perengaria of Navarre. HE DIED WITHOUT ISSUE. + 7 v. Geoffrey, born Abt. 1160. 1225/26 in Salisbury, Wilts, England. 7. Geoffrey (King Henry II Plantagenet, Geoffrey, Fulk V, Fulk IV, Geoffrey II de Castinais, Geoffrey I de1) was born Abt. 1160. 10 i. Aurthur8, born Abt. 1185; died 1203. 8. King John, Lackland (King Henry II Plantagenet, Geoffrey, Fulk V, Fulk IV, Geoffrey II de Castinais, Geoffrey I de1) was born December 24, 1166 in Beaumont Palace, Oxford, England, and died October 19, 1216 in Newark Castle, Newark, Nottinghamshire, England. He married Isabell August 24, 1200 in Bordeaux, daughter of Aymer de Tallifer and Alice. She was born Abt. 1188 in Angouleme, and died May 31, 1246 in Fontevraud. Shortly after he became King, he quarreled with the Pope, who deposed him and proclaimed him no longer King. John ignored the deposing, and made a gift to the Pope of all the realm, crown and revenue, by written indenture, dated Monday, 13 May 1213. John then received the crown back as the Pope’s tenant and vassal, at a rental of a thousand marks for the whole kingdom, 700 for England and 300 for Ireland. Under this condition the Barons of England were only yeoman, or free-holders, or copy-holders of King John, the free-holder of the Pope, and tiring of John’s tyranny, they called a conference after King John had left the Abbey at Saint-Edmundsbury (where he had been asked to attend the conference, which had been called by Stephen Langston, Archbishop of Canterbury), at which meeting nothing was accomplished, the barons took a solemn oath on the high altar, that they would stand united until they could compel the King to confirm their liberties, or they would wage war against him to the death. They did wage war, “a holy crusade against John to recover the liberties their forefathers had enjoyed.” Virtually powerless, and with nearly his whole Baronage and the majority of his subjects of all degrees in arms against him, he finally called his Barons to a conference. They said, “let the day be the 15th of June and the place Runnemede” (which is in sight of Windsor Castle, and was used as “the field of council”). These Barons were astonishingly inter-related. Among them were several instances of father and son, of father-in-law and son-in-law, of brothers and cousins. Twenty of the twenty-five were related in the degree of second cousin, or nearer. Of these twenty-five, only seventeen have descendants surviving to the present day. They had a common descent from Charlemagne. On the 15th day of June, 1215, more than two thousand knights and barons were encamped on the field of Runnemede to await the coming of King John and secure from him the rights of the people of England, although John had previously sworn by “God’s teeth,” his favorite oath, that he would never agree to such demands or any part of them. Runnemede was the “ancient meadow of council,” and is within sight of Windsor Castle. For ages, this had been crown land and rented for pasturage. When it was proposed a few years ago (from the Crown Edition of Magna Carta, reprint 1945), to sell the field of Runnemede to the highest bidder, a great outcry arose. (The former Cara Rogers, now Lady Fairhaven, an American girl, a member of the “Magna Carta Dames,” bought and presented to the British people the field of Runnemede as a memorial to her husband, to be kept for all time as a sacred, historic spot). On 15 June 1215, before the day passed, the king affixed his seal to the original, but preliminary draft known as the “Articles of the Barons,” which contained forty-nine articles, setting forth the principles of the Charter. The exact terms of the Charter were decided upon during the four days that followed. On the 19th of June 1215, the great seal was affixed, presumably to twenty-five duplicate copies, perhaps one for each of the twenty-five Surety Barons, who were to see that King John kept his promises. Neither the king, the barons, nor the knights could read or write, except a few, but a scholar, who was the Secretary of the Baron of Kendal, had accompanied him to Runnemede. Notes for Isabell: She was the mother of all his children. John S. Wurts, in his Magna Charta, pages 6 to 17, inclusive. died November 16, 1272 in Westminster, Palace, London, England. William De Longespee was born 1173 in England, and died March 07, 1225/26 in Salisbury, Wilts, England. He married Ela Fitzpatrick. She was born 1191 in Amesbury, Wiltshire, England, and died August 24, 1261 in Lacock, Wiltshire, England. Notes for William De Longespee: According to Gary Boyd Roberts’ Royal Descents of 500 Immigrants..., pp. 345-347, the mother of William LONGESPEE (natural son of King Henry II of England) was Ida, who married Roger BIGOD, 2nd Earl of Norfolk. One source of this is evidently a charter of William LONGSWORD published in the Cartulary of Bradenstoke Priory, ed. Vera C. M. Longdon, in which Countess Ida is explicitly named as his mother. The fact that William named a daughter Ida does lend credence to this, of course. Stephen De Longespee, born Abt. 1216 in Sutton, Co.
Northampton, England; died 1260 in Sutton, Co. Northampton, England. King Henry III was born October 01, 1207 in Winchester, England, and died November 16, 1272 in Westminster, Palace, London, England. He married Queen Eleanor of Provence January 04, 1235/36 in England. She was born Abt. 1217 in Aix-en-Provence, and died June 24, 1291 in Amesbury, Wiltshire. Brother of King Richard. King of England. He was crowned king 28 Oct. 1216, when only nine years of age. On 14 January 1236, he married Eleanor of Provence. A Plantagenet King; House of Anjou. Queen Eleanor took the veil at Amesbury in Wiltshire, and died there 24 June 1291. Their elder sons, John and Henry, died young. QUEEN ELEANOR’S GENEALOGY (1) CLOVIS, King of the Franks, married Clothilde, his son; (2) Clothaire I, born 497, died 561, married Ingolde, their son; (3) Chilperice I, born 523, died 584, married Fredegonde, born 543, died 598, his son; (4) Clothaire II, born 584, died 628, married Bertrude, who died 618, his son; (5) Claribert II, born 608, died 631, married Gisela, daughter of Arnoud, of Gascony, his son; (6) Boggis, Duke of Aquitaine, died 688, married Oda, his son; (7) Eudes, Duke of Aquitaine, married Valtrude, daughter of Valtrude and her husband, Walchigise, Count of Verdon, son of St. Arnolph, Bishop of Metz and his wife, Dodo, his son; (8) Hunold, Duke of Aquitaine, died 774, his son; (9) Waifir, Duke of Aquitaine, died 768, married his cousin, Adele, daughter of Loup I, Duke of Gascony, his son; (10) Loup II, Duke of Gascony, died 778, his son; (11) Adelrico, Duke of Gascony, died 812, his son; (12) Ximeno, Duke of Gascony, died 816, married Munia, his son; (13) Inigo Arista, first King of Navarre married Iniga Ximena, his son; (14) Careia II, of Navarre, married Urracca of Gascony, daughter of a cousin, Sancho II, his son; (15) Sancho I, became King of Navarre in 905, married his cousin Toda, daughter of Aznzr Galindez, Count of Aragon, his son; (16) Garcia III, became king in 921, died 970, married Teresa Iniquez of Aragon, and had (17) Sancho II Abarca, died 994. He married Urracca Clara, daughter of Fortuna Ximenez, of Navarre, his second cousin, his son; (18) Garcia V, King of Navarre, died 999, married Ximena, daughter of Consslo, Count of Asturias and his wife, Teresa. They were the parents of the earlier of the two kings, both called Sancho III, this one; (19) Sancho III King of Navarre from 1000 to 1035, married Munia, daughter of Sancho of Castile, and thus united the two important Houses of Castile and Navarre, to which that of Aragon was later added, his son; (20) Ramirez I, founded the kingdom of Aragon, was killed in battle by the Moors, 8 May 1063. By his wife Gisberge, he had; (21) Sancho-Ramirez, died 4 June 1094, King of Aragon, married, first, Felice, who died 14 April 1086, daughter of Hildouin, Count of Rouci, his son; (22) Ramirez II, King of Aragon, married Agnes, daughter of William IX, Duke of Aquitaine. Raimond-Berenger IV, King of Provence, married Beatrice (Beatrix), daughter of Thomas, Count of Savoy, his daughter; (8) ELEANOR OF PROVENCE, became the wife of HENRY III KING OF ENGLAND as stated above. King Edward I, born June 17, 1239 in Westminster, Palace, London, England; died July 07, 1307 near Carlisle, England. He married Princess Eleanor of Castile in Las Huelgas, daughter of King Ferdinand III. She was born abt. 1244 in Castile, and died November 24, 1290 in Herdeby, Near Grantham, Lincolnshire. EDWARD I, KING OF ENGLAND, (called Longshanks), Earl of Chester, born at Westminster 17 June 1239, married Eleanor of Castile. In 1272 he went on a Crusade as far as Acre, where his daughter JOAN (see later) was born, and although he inherited the crown that year, he did not return to England until 1274, being crowned on August 19th. He was eminent as a ruler and as a legislator, and succeeded in enacting many new laws. He determined to authorize no new legislation without the counsel and acquiescence of those who were most affected by it. Not until late in his reign did he call a whole Parliament together. Instead he called the Barons together in any matter that affected the Barons, and the representatives of the townsmen together in any matter that affected the townsmen, and so with other classes. Edward’s first wife, ELEANOR OF CASTILE, whom he married in 1254, died 20 Nov. 1290. Reign: 1272-1307; Of the Plantagenets, House of Anjou. In 1270 Edward left England to join the Seventh Crusade. The first years of Edward’s reign were a period of the consolidation of his power. He suppressed corruption in the administration of justice, restricted the jurisdiction of the ecclesiastical courts to church affairs, and eliminated the papacy’s overlordship over England. In 1290 Edward expelled all Jews from England. In 1296, after invading and conquering Scotland, he declared himself king of that realm. The conquest of Scotland became the ruling passion of his life. He was, however, compelled by the nobles, clergy and commons to desist in his attempts to raise by arbitrary taxes the funds he needed for campaigns. In 1307 Edward set out for the third time (at age 68) to subdue the Scots, but he died en route near Carlisle on 7 Jul 1307. Of Castile and Leon Spain. Eleanor was only about ten years old when married to the 15-year-old Edward of Westminster at Las Huelgas in 1254. Such child marriages were commonplace in Europe in the Middle Ages and the brides were usually consigned to their husbands’ families to complete their education. The marriages were not consummated until the bride reached a suitable age (usually 14 or 15) and in Eleanor’s case it seems to have been 18 or 19.
died September 21, 1327 in Berkeley Castle, Gloucestershire. Kings and the Imperial and Royal House of Vere.